While the U.S. interior department sees the great value of restoring rivers, preserving “landscapes of historic national significance,” and expanding urban parks, there’s a new focus on justifying the money that goes into conservation and park projects by citing jobs numbers. In a speech at Greater & Greener: Reimagining Parks for 21st Century Cities, a conference in New York City, Interior Secretary Ken Salazar said national park and recreation jobs now total 9 million in the U.S. Of those numbers, fishing, hunting, and boating take up 6.5 million. However, he noted that consulting firm McKinsey & Co has estimated 14 million jobs could come from the parks and recreation field; it remains an untapped opportunity. Salazar made the economic case for increasing investment in urban parks, too, arguing that the most economically vibrant cities are those with the greatest parks. As an example, he pointed to the $350 million river and park restoration projects in San Antonio that will expand the riverfront beyond downtown, creating many new jobs in the process. Given tourism is so huge there, there’s already relatively little unemployment. In another session, similar arguments were made by Oklahoma City Mayor Mick Cornett, eco-entrepreneur Majora Carter, and Kofi Bonner, the developer of the gigantic Hunter’s Point project in San Francisco: parks mean economic development and jobs. Oklahoma City, which has experienced a renaissance under Cornett, is investing heavily in its downtown, adding botanic gardens, street cars, bike trails, and a new canal. 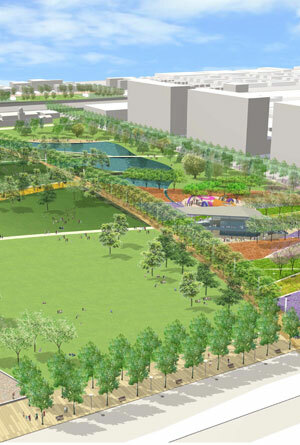 A new 70-acre central park is coming soon at a cost of $120 million, creating jobs for many landscape architects, construction firms, and local maintenance workers (see image above). However, Oklahoma City is different from other cities because it has financed all this public development with a penny sales tax, which means there has been no debt. Cities in California and elsewhere could do well to follow OKC’s example. 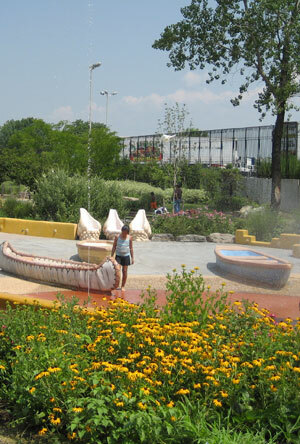 Carter described how she transformed a park Hunts Point in the Bronx from a dump into a vibrant green space. She said improving a community’s health through parks is a great way to improve their economic outcomes. A human community is as much an ecosystem as a community of plants. Carter, who has won a MacArthur “genius” grant for her work, said she’s now focused on building out a green street with green medians, lots of trees, and pop-up stalls and shops, which can all create local jobs. She’s been making the case for green jobs for some time (see earlier post), arguing that park maintenance, green roof and street installation, and recycling can be done locally in poorer communities if there is an investment in creating skills. For Bonner, making money and doing right, environmentally, seems to the right approach. In the largest urban redevelopment in the U.S., the 720-acre Hunter’s Point in the southeast corner of San Francisco will include more than 320-acres of green open space, with some 12,500 new homes, 30 percent of which will be affordable. Bonner said Hunter’s Point has been a depressed area since the Navy shut down the naval base in the mid-70s, killing off 30,000 jobs. 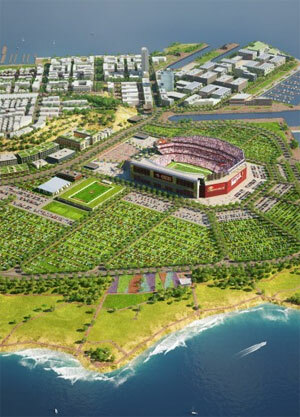 Now, with the 49ers leaving the nearby Candlestick Park, freeing up the Candlestick Point area for redevelopment, Bonner said there’s a real opportunity to turn the entire area around. Venture capitalists have long been looking for a large enough campus for a major green tech hub. To pull in these green firms and tenants, Bonner said the green open space was key, which is why they will be putting $240 million to build the area’s parks, covering $8 million in annual maintenance through assessments on homeowners. “Park amenities are really key to quality of life.” All that maintenance will hopefully mean local jobs, too. Please credit the landscape architects whose work you picture above. This should be standard practice for all ASLA publications.